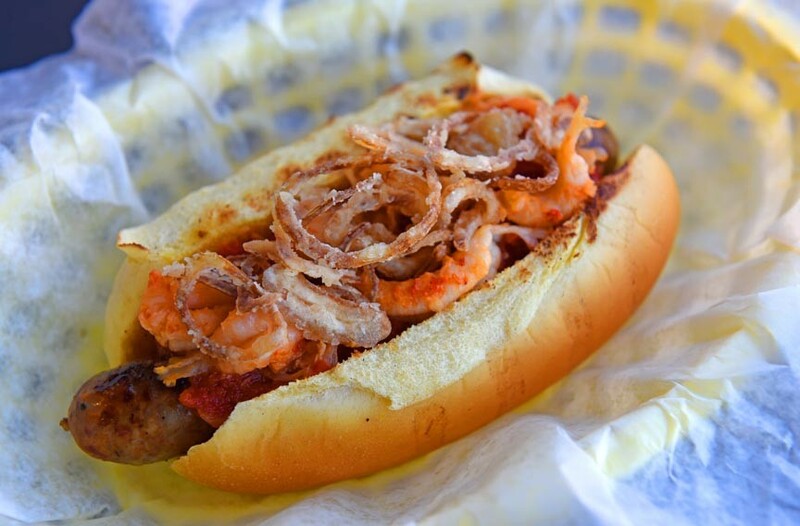 The andouille sausage dog at Stroops Heroic Dogs is a combination of the classic Louisiana sausage mixed with dates and topped with crawfish to create a stellar blend of New Orleans-style flavors. Either you love hot dogs or you're wrong. It's really that simple. And if you're wrong, it's likely that you somehow missed out on Richmond's love affair with the lowly dog, which has roots in Dutch & Co.'s Saturday back door dogs. The venture acquired instant hotness and frequent sellouts in less than an hour. And its natural outgrowth was Stroops Heroic Dogs, where re-imaginings of the frankfurter will slap your taste buds silly, such the banh mi-dip dog, a five-spice hot dog with a schmear of chicken liver plus pickled carrot, radish, jalapeño mayo, cilantro and a side of pho jus. For another take, head to Boulevard Burger & Brew. Under the red- and white-striped roof you'll find the Frankencheese — a grilled hot dog blanketed in mac 'n' cheese and sriracha. It's the ultimate guilty pleasure, especially with an alcoholic milkshake on the side, say, a chocolaty Muddy Beaver.